The Mother of All Nail Tears!!!!! Does Zoya have a polish that shares the same name as you? Did you get it? Do you like the color?? While I was getting ready for work yesterday morning, I reached down to open one of the sink cabinets. To give you some background, the doors to my sink cabinets are weird in that they are old and outdated things with tiny little handles (think the size of a doorknocker of a dollhouse) located in the MIDDLE of the door. (more ornamental than functional) To make the process of opening said cabinets even more difficult is that they are sealed from within by magnets. So I try and pull at the corner of one of the cabinets, not paying attention to what I was doing and LOW and BEHOLD I catch the corner of my thumbnail, my nail polish peels/chips off the corner ruining my mani, and I get a small tear. I was annoyed at the polish chipping because it was pretty noticeable and it meant that I had to take off all my polish before trying to get out the door on time for work. I didn't really worry about the nail tear since I have this lovely little nail repair kit, which I tossed into my bag. I've used this only one time previously and it worked really well, so as soon as I got to work, I applied some glue, threw on some powder and went about my work. Towards the end of the day I notice that the repair didn't hold, and to make it worse it got bigger!!! ( > o < ) I'm disappointed in this product and will not be using it again. I got it because it was cheap and I definitely got what I paid for. I remembered a tip from a book I read where it said you could use kleenex as a patch. I grabbed some kleenex, applied some glue and that seemed to work. The only thing that really bugged me about this polish is that it was sheerer than I expected. I applied three coats and still has Visible Nail Lines (VNL). Maybe they'll be less visible if I use a ridgefiller. ( o _ O ) ??? Nfu Oh #52: A dark blue/purple base with green micro-glitter and larger green flakes. The color reminds me of peacock feathers, but a friend of mine referred to it as "very mermaid". This polish is tricky to capture. It's really a bit darker than how it's pictured here. I took this indoors and used the flash because I wanted to try and catch those lovely irregular flakes. (Don't think I was too successful) In any event it's a gorgeous color. I received a lot of compliments when I wore this one. 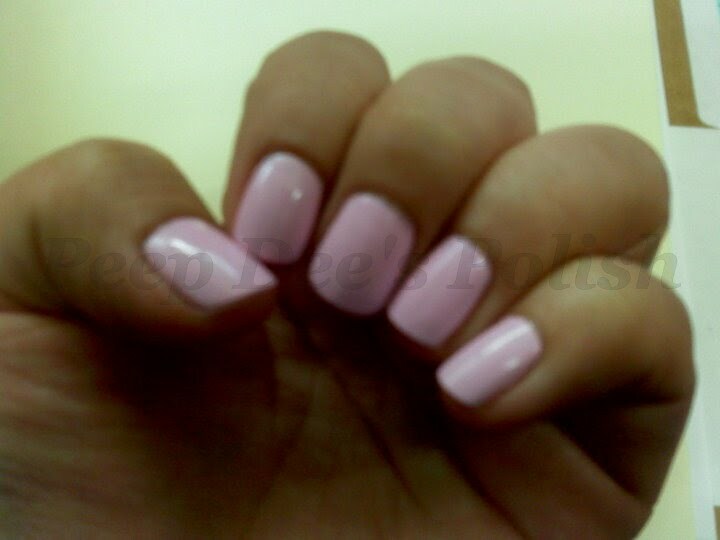 Zoya - "Roxy": Magenta Jelly Base with Fuchsia glitter. This is one of ten polishes I acquired from the Zoya Nail Polish Exchange program that ended last month. My first time using this brand and so far I'm pretty pleased with it. The wear is nice and the application is pretty easy too. I had to use 3 coats to make it look nice and even. Mod About You: Cotton candy pink. It's opaque, which I love, because most pinks out there are sheer. The first coat went on kind of streaky but it evens out after that. It was easier to apply than the dupe I bought (Essie's Fiji), which was a TOTAL NIGHTMARE!! Here Today..Aragon Tomorrow: I think it's a "Robin Hood meets G.I. Joe"-type of green. Please excuse the tip wear because I took this photo about three days after I first applied. I'll try and post a better one later on. Damone Roberts 1968: A minty green candy apple. It's a special edition polish, and unfortunately I only purchased one bottle. It's one of my faves so I'll have to make it last.